In a medium pot, heat olive oil over medium heat. Dice onion and peppers*, add to pot. Cook until onion is translucent, 4-5 minutes. Remove corn from cob and add to cooked peppers/onion mixture. Continue to cook for 2-3 more minutes. Stir in 2 cups veggie broth and salt, bring to a boil and reduce to a simmer. Let cook for 15-20 minutes. 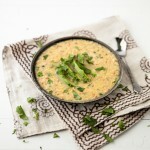 Remove from heat and using either an immersion blender or regular blender, puree soup. Return to heat and stir in cilantro, heavy cream, and more veggie broth if needed. Heat for 1-2 more minutes over medium low. Taste and add more salt if needed. *If you do not like heat, remove seeds from jalapeños as well. Vice versa- if you really like heat, leave the serrano seeds in!